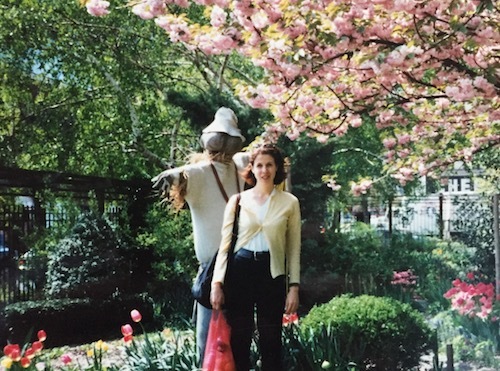 Lower East Side, NYC c.1998 in vintage cashmere, obviously. Linda Zimmermann, the youngest daughter of working class immigrants, learned early how to make lemonade from lemons, not only making due with what one has, but making better (and cooler). Armed only with a sense of style that skews a little off center and a passion for cashmere (of course) she finds inspiration in everything from nature to history to art. She has been repurposing cashmere, along with other fine/found materials, since 2001 - hand stitching every one-of-a-kind piece. Her designs have sold in boutiques and galleries nationally, including The Walker Shop in Minneapolis, Legacy, Move Lab & In God We Trust in New York and Noodle Stories in LA. Her line includes clothing and accessories for men and women, and occasionally for baby and home. So soft and totally inventive Linda Zimmermann Cashmere always starts with 100% recycled 100% cashmere. © Linda Zimmermann Cashmere, 2018. All rights reserved.